Unfair ERT finished | Mothers Against Wind Turbines Inc. The Environmental Review Tribunal (ERT) is over for the NRWC proposed wind farm of 77 three-megawatt turbines. By the middle of April the Tribunal will have to present a decision, and based on past experience that decision will probably be “appeal denied”. Thousands of letters, hundreds of hours, weekly meetings, fundraisers and protests have been compressed into one week of hearings. All our concerns: for the sound power levels, gaps, absent and/or incomplete site visits, Blandings turtles and Red Mulberry, PCB’s and more were mostly stricken from the record because only “expert” witness is acceptable. The Tribunal’s opinion is that we had only opinion not qualified facts. Already health concerns are surfacing from the five HAF Wind IWTs, such as vertigo, tinnitus, migraines, sleep loss and annoyance. This is not only from the visual impact or from the “stringent” setbacks, but also caused by the underground vibrations through the Karst, into homes as reported from a home 4.5 km from those turbines. The story still remains to be told as to how many people will begin to realize that it is these vibrations that are causing their discomfort. What about our concerns for the Smithville PCBs stored in the bedrock only kilometres away from their nearest turbine? Will these vibrations cause the PCBs to escape from the bedrock where they have been monitored for so many years? What will be the effect to our wells and waterways? Who will take responsibility for the residents of Niagara if the PCBs escape? Why have people vacated their homes? 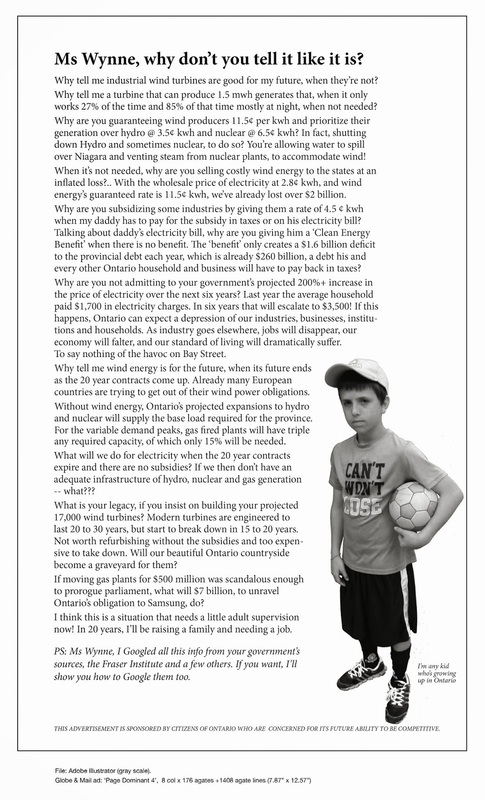 Protecting our children from Industrial Wind Power Emissions is our first priority! Please tell it how it really IS! Wind Turbines too Big or Host Farmers Land Base too Small? Ontario’s Green Religion 2: indoctrination?